The catalogue gives you the ability to manage your library borrowing and track your reading under the heading My Account. Log in to BiblioCommons by entering your library card number or username if you have one and password or PIN. Once logged in a page displays your checked out items and their return dates. You can also access lists of items you have on hold and fines. The account settings page allows you to change your username, password and preferred pick-up locations for items on hold. To change name, address, telephone number, or other personal details, complete our form, or contact us. Use the privacy settings page to change who can see items and comments on your shelved items. Access your account online in our catalogue (you can also check with your iPhone or Android device using our BiblioCommons apps). Access Christchurch City Libraries from your iPhone, iPad or iPod Touch with the free BiblioCommons app. The Christchurch City Libraries mobile app lets you find titles, place holds, create lists and get information about our libraries. Search the collection, with filters to zero-in on the titles you’re seeking. Browse bestsellers and new material. Map the locations where your title is available now. Scan an ISBN barcode and find library holdings. CCL Mobile makes it easy to find and discover titles, manage your account, and get the branch and availability information you need. Please note there is a minimum screen size requirement of 320dp x 480dp on an Android device to run the mobile app. Find out how to make the most of our social catalogue. You can still access the previous version of My Account. There are a few services that you can use to help you manage your account. Please note that these are not provided by Christchurch City Libraries and may require that you give them access to your account information — if you do so it is at your own risk. We recommend that you read their terms of service carefully so that you understand the service. 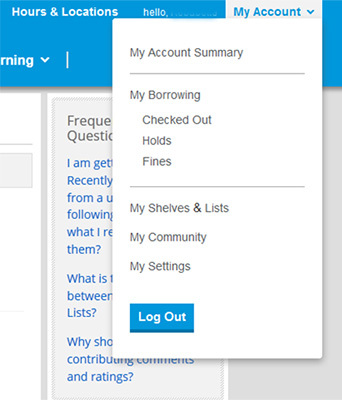 Library Elf is a web-based service that you can use to help manage your account, by receiving email and/or RSS alerts before your items are due, and about overdues and holds. Multiple library cards can be tracked by Library Elf, allowing all of your family’s borrowing activity to be summarised into a single consolidated email. Christchurch City Libraries has subscribed to Library Elf, allowing all borrowers to receive the premium service for free. Library Extension is a browser plug in or extension that lets you instantly see book and eBook availability from your local library when browsing book titles on other sites. Once installed, select Christchurch City Libraries and Library Extension will display holdings information for books when browsing on Amazon, for instance. How do I get a password or PIN? How do I get a library card for my child? What forms of identification are accepted to get a card? I can’t remember the password / PIN for my library card. How do I get a replacement library card?